Over the past decade, Hawaii has completely transformed its high school education to provide training to students so they are employable immediately upon graduation. Hawaii founded the High School Leadership Compact in 2005 to provide students with vocational and trade experience and certification while still in high school. Gradates of secondary and post-secondary vocational programs can find employment opportunities in the steadily growing tourism and hospitality sector, or quickly rising industries like healthcare and construction. This page outlines vocational and trade school opportunities in Hawaii and the earning potential for trade school graduates in the state. 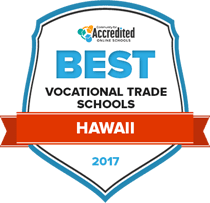 The following rankings present an in-depth review of the trade and vocational school available in Hawaii. With so many community colleges, trade schools and career institutions, a huge selection of programs are available, although hospitality and tourism sectors are particularly popular. Explore our rankings of accredited Hawaii schools; our list is based on important factors such as tuition, length of program and availability of financial aid. Vocational degrees at Honolulu Community College are administered through the college's Career and Technical Education department. Prospective students can get education and training in a range of fields such as technology, manufacturing, human services, automotive, computers, construction and cosmetology. Certificates are also offered in many of these programs. Students may be required to earn a C grade or above in general education courses like math and English to graduate. Students in professional certification programs will prepare to sit for required license examinations. Class schedules are posted online and show the numbers of students currently enrolled in a class, as well as the number of remaining available seats. Hawaii Community College started offering classes to adults in 1941. In addition to teaching associate of science degrees in architecture, agriculture, electricity, carpentry, electronics, auto body, nursing, forestry and welding, the college has 13 student services. Students enrolled at Hawaii Community College can use counseling, the Learning Center and computing services. Career and job search support is offered online and through the Career and Job Development Center. The school operates on a semester system. Application and class registration deadlines apply. Shorter vocational continuing education classes are also available. These classes may be fully lecture based. Kauai Community College is a part of University of Hawaii community colleges. The college is accredited by the Accrediting Commission for Community and Junior Colleges. Two year vocational nursing and culinary arts programs are accredited by career related accrediting agencies. By completing a prior learning assessment, students could receive college credits for relevant work experience or independent study that they completed. An Associate of Applied Science and an Associate of Science are the vocational degrees that can be earned in two years. These degrees are offered in various fields such as auto body repair and painting, electronics technology, nursing, automotive technology and carpentry. Windward Community College offers both a certificate of achievement and an associate in science for their veterinary technology program, either of which will help lead students towards a successful career in a veterinary hospital. Like many allied health programs, veterinary technology will incorporate many hours of clinical studies to prepare students for hands-on situations they may come up against when working in this field. While college is expensive, students have the option to apply for federal aid, scholarships, and grants to make sure financial issues don’t come between them and their education. In Hawaii, vocational and trade school programs are offered at 63 high schools and seven community colleges. These schools focus on providing education in six broad career pathways: business, arts and communication, industrial and engineering technology, public and human services, health sciences and natural resources. Use the search tool below to browse vocational and trade school options in Hawaii. In the 2012-2013 school year, there were 27,733 secondary and 9,770 post-secondary students enrolled in career and technical education (CTE) programs in Hawaii with a 99 percent graduation rate. By 2018, Hawaii is expected to gain 30,900 jobs, with approximately 58 percent of these requiring workers to attain some form of education or certification after high school. President William McKinley High School was the first CTE institution in the state to join Hawaii’s Project Lead the Way program, which allows high school students to study pre-engineering. As a result, graduates have studied mechanical, civil and electrical engineering at institutions such as Carnegie Mellon University and the Massachusetts Institute of Technology. Overall, middle-skills jobs comprise nearly half—49 percent—of Hawaii’s job market. Hawaii has pledged that all graduating high school students are prepared to enter a career or a college-level vocational and trade program. Hawaiian high schools allow students to earn certifications that will make them employable after graduation and earn credits that can be applied toward a one-year or less-than-one-year certificate of an associate degree. Refer to the table below for more information about the credentials that Hawaii’s vocational and trade students earn. Healthcare-related professions, such as positions for nursing assistants, licensed practical nurses and medical technicians are projected to grow faster than the national average over the next 10 years. According to the Hawaii Workforce Infonet, the healthcare and education sectors in the state will increase by 4,760 new jobs by the end of 2016. The agency also projected that professional and business services will increase by 4.2 percent and construction will increase by 8.5 percent during the same period. The table below illustrates vocational and trade careers experiencing the most growth in Hawaii, along with salary information for the state and the nation. Hawaii’s capital city of Honolulu is home to over 100,000 companies, ensuring that graduates of vocational and trade schools have favorable job prospects. The largest provider of vocational degrees in Honolulu is the Honolulu Community College, with nearly 700 vocational student enrolled. HCC focuses heavily on homeland security and law enforcement as these degree plans translate easily toward military careers, which is one of the biggest job sectors in the city. Honolulu’s second most popular school for vocational students is the Kapi’Olani Community College, a part of the University of Hawaii education system. Kapi’Olani offers programs ranging from culinary arts, hospitality and tourism, to information technology as well as a variety of healthcare and health service education opportunities, such as emergency medical technician, medical assisting, dental assisting, and various nursing specialties. The CTE Center develops the standards and training programs for vocational and trade schools in Hawaii, as well as CTE courses at the secondary level. The Hawaii Department of Labor and Industrial Relations provides information on wages, unemployment insurance, industry trends and workforce development in the state. Includes data on Hawaii's unemployment rates, employment projections, wages for specific industries and green jobs. The state’s professional organization for workers in the hospitality and tourism industry. Provides information on events, seminars and career opportunities for working professionals. Professional organization for healthcare employees in the states, providing resources, reports, and information on opportunities for continuing education. Hawaii’s Workforce Development Division provides assistance to employers and job hunters. WDD works with educators and employers to identify skills needed in the workplace and the best strategies for teaching them to students.